The first movie shown in the theater was “Three Week Ends,” a silent film starring one of the true embodiments of the roaring twenties, Clara Bow. The theater was operated by the Keith-Albee-Orpheum Corporation until 1929 when it was acquired by the Radio Corporation of America to form RKO Pictures. The Keith-Albee was then renamed RKO Keith’s Theatre. 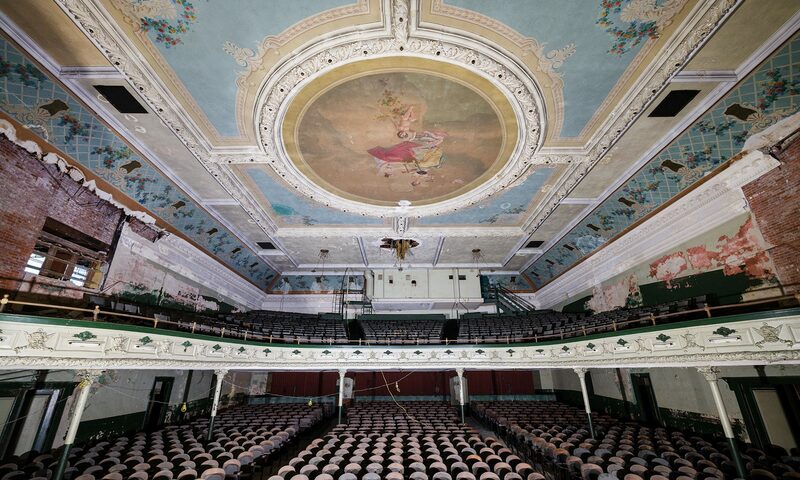 The Keith’s was designed in the Spanish Baroque Revival style and had 2974 seats. The ceiling was painted a deep blue so that clouds seemed to move across the ceiling, making it look like clouds floating across the night sky. 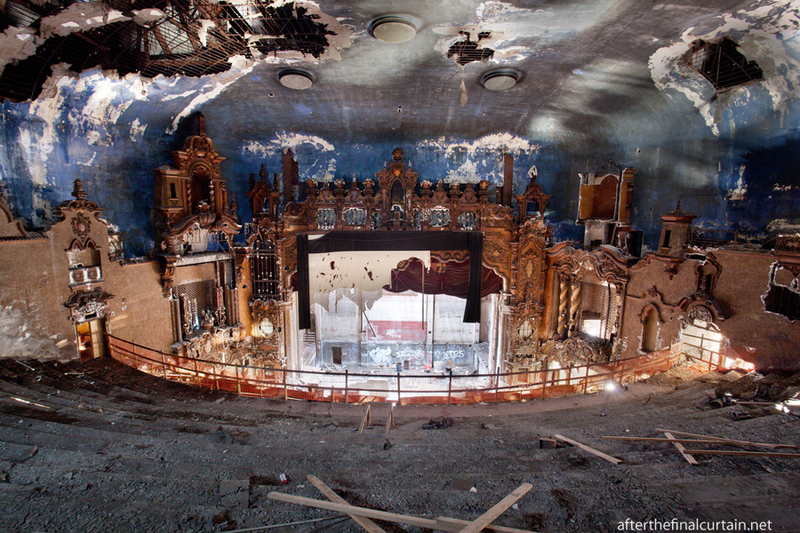 The cloud effect came from projectors on either side of the balcony, which broke in the theater’s later years. 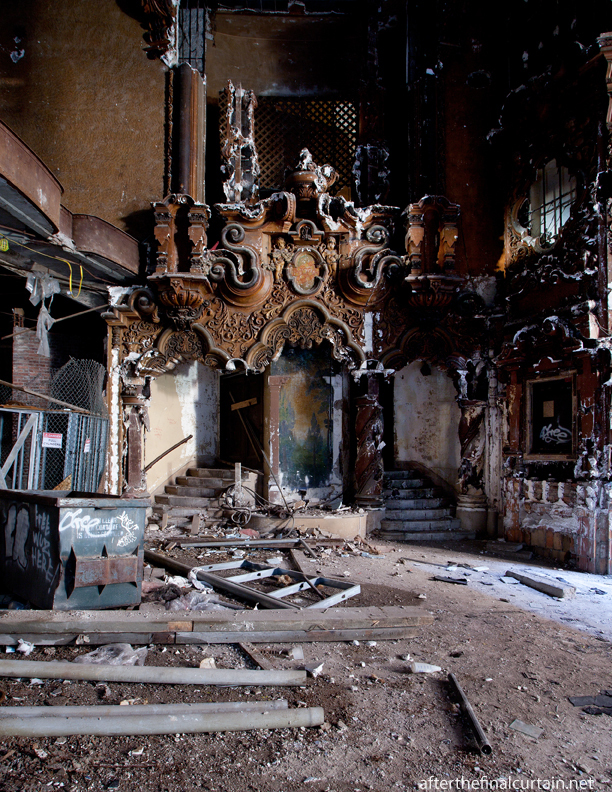 Lamb designed other theaters with the same atmospheric effect, including the Loew’s Pitkin and Proctor’s 58th Street. In the center of the oval-shaped lobby was a fountain with a centerpiece featuring a statue of Cupid surrounded by several dolphins and stocked live goldfish. It was moved before the theater closed and is rumored to be in either an East Village restaurant or a dentist’s office in New Jersey. The lobby of the Keiths was given landmark status in 1984. The building was sold in 1986 to developer Tommy Huang, who closed the theater a few months later. Shortly after Huang announced the theater would be torn down to make way for a mall. The Flushing community was outraged and people protested in front of the theater. 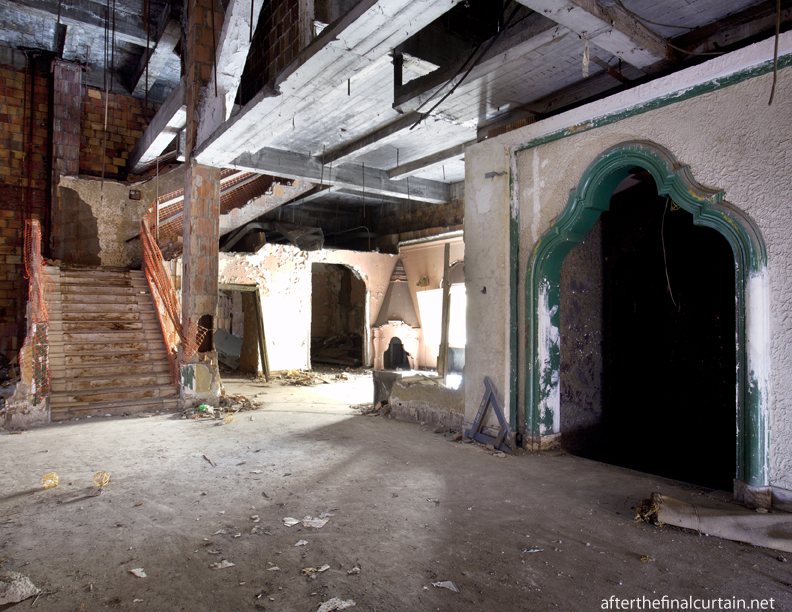 Huang started work on the theater’s lobby disregarding it’s landmark status, and stripped it to prepare for renovations. 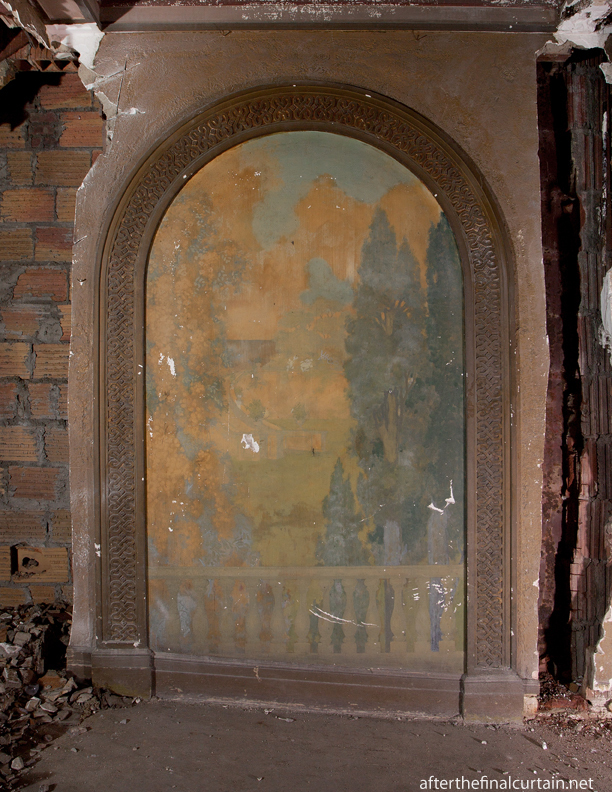 The city stopped demolition in February 1987 — since then, the Keith’s has been in a state of disrepair. A plan was recently approved that proposes to tear down the auditorium and replace it with a 17-story tower that houses 357 apartments, a senior center and retail space. 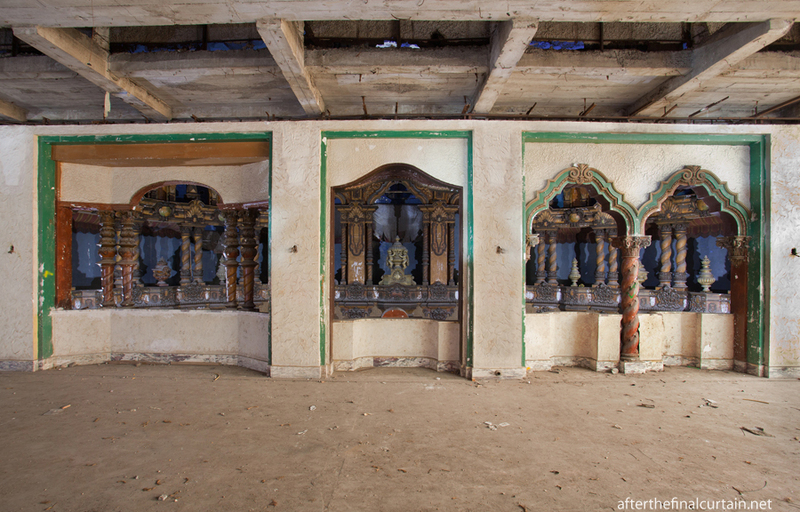 Of the original architecture, only the lobby and ticket booth will be saved. My high school graduation (Flushing High School) was held here in 1961. About 900 graduates and families. I also remember early dates in the balcony. Ditto for my graduation, 1968! Now the whole neighborhood is Little Korea…..
It’s unfortunate this magnificent theater is going to end up as condos. The style is VERY similar to the Majestic Theatre in San Antonio, Texas, which was completely restored and is the home of the San Antonio Symphony and a popular venue for touring shows. 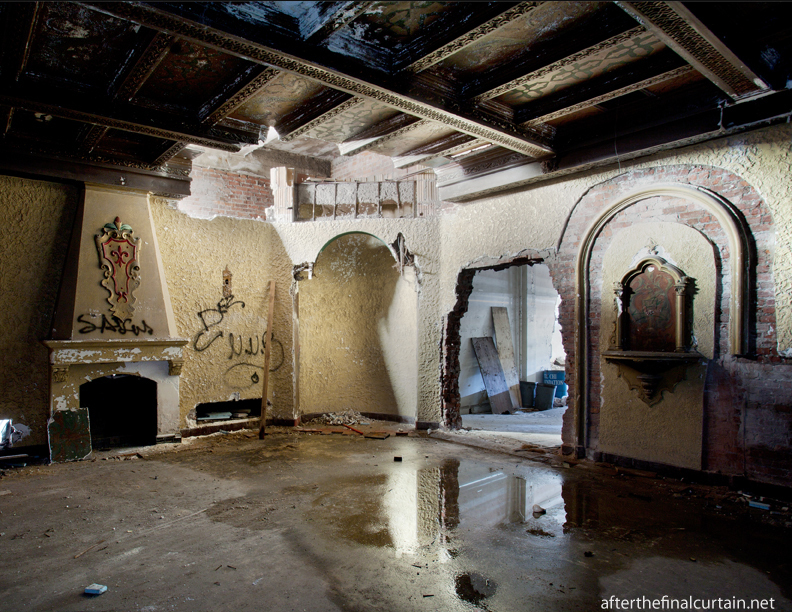 I SO hope you save this lobby at least – so sad – I grew up in Flushing and the theater was my favorite place – the powder room was a little girl’s fantasy of what a movie star’s house would look like, and the lobby – wow – I can’t believe the developer got away with what he did. Saw the Ali and Norton fight here with friends. Ali won in the last round. I will miss it very much. Developer Tommy Huang should RUN OUT OF TOWN….but only AFTER he’s fined for what he did. Wow, My brothers use to tell me about this place. It looked so Amazing. I’m upset that stuff like this has to Happen!!!! BRING BACK THE THEATER!!!! Seeing Poltergeist was the last time I was in this theater. I was younger then and unaware of the theater’s magnificence. 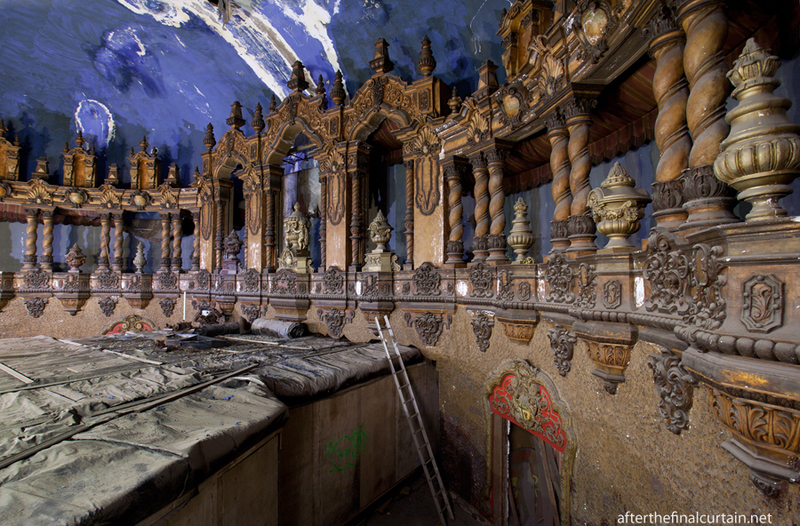 To recall what it looked like through photos of it’s deterioration is so sad – like the opening scene of the movie Titanic only this is a “theater wreck”. My brother and I saw Superman and Star Wars in this grand theater. We use to stare up at the magnificent saphire-blue lit ceiling before the movie started. I even caught myself a few times looking up at the the theater’s ceiling during the actual movie. I even remember where we sat. We pretty much always sat on the main floor close to an aisle towards the left. The detailed moulding, murals and framework throughout this majestic theater just added to its grandeur. After the movie, we would linger around and take in its magnificence. As a little girl it was such a treat to be able to see a movie there. The theater looked so rich that I wondered as a little girl if it resembled the rich folks mansions. It is so disappointing to see it in such disrepair. An apartment complex with Senior center and retail space? My guess is that somehow the senior center idea will be ditched and luxury apartments will go up. Great, more unaffordable housing. The community would still like to see a movie theater there. A municipal parking is just walking distance away. 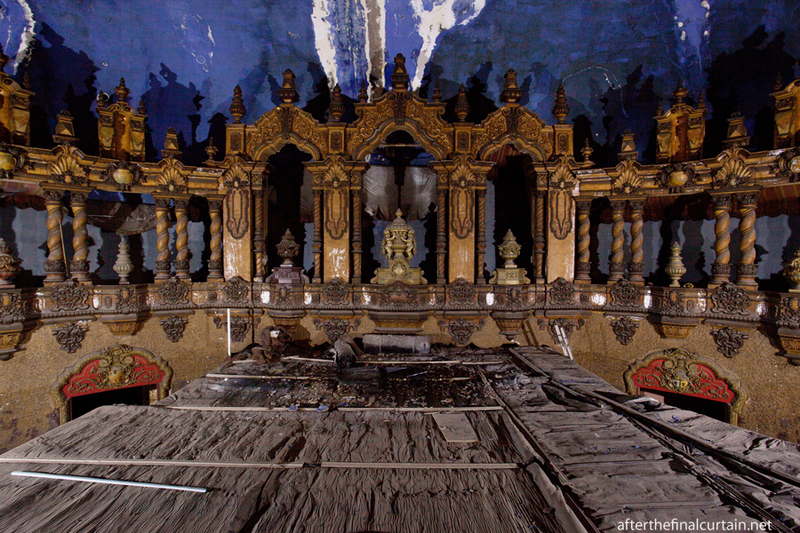 Can’t this theater still be salvaged and restored? 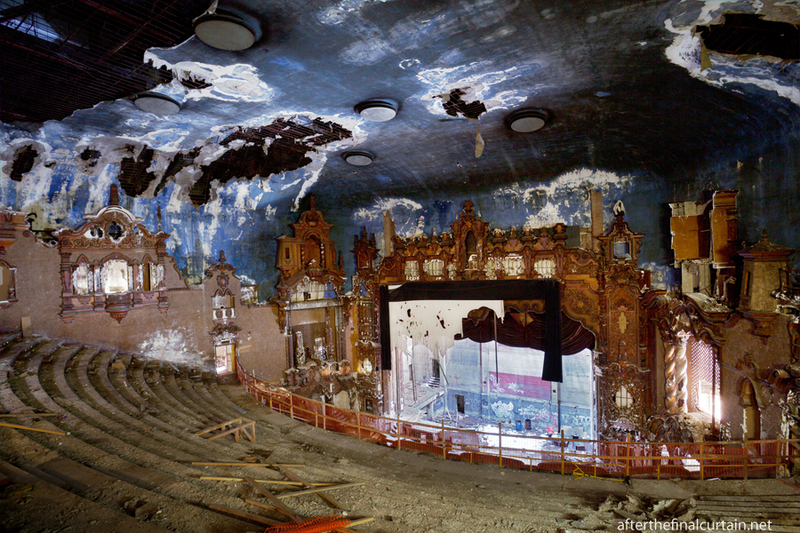 How long will a NYC landmark be allowed to decay like this? Thank you for taking and posting these photos! The RKO Keith’s was a big part of my life growing up in Flushing during the 1960s and ’70s. I saw so many movies here, including The Godfather and The Godfather II, but probably my favorite was Murder on the Orient Express in 1974. The decor of the RKO perfectly matched that of the film. I think the last movie I saw there was either Star Trek 2 or Return of the Jedi. It’s been sad to see the theater sitting there empty for the last quarter century, and even sadder to see how it’s fallen into disrepair. I hope that if it proves impossible to restore the RKO as a theater, at least the lobby will be restored and serve as a reminder of this once-great palace. My dad saw just about everything there since 1937 on, he took me there around 1970, and told me of Boris Karloff and others that played there live, awesome memories, I saw ROCKY 1 there, and I am pretty sure I saw STAR WARS there too…WHAT A CRIMINAL Shame, I know the area is completely oriental, and they have no history in that theatre, well, that’s where we are at today, Flushing History down the drain, THE TOWN was name correctly, glad I left. We’re glad you left too. I remember seeing a midnight movie – I think it was the 1973 movie about Jimi Hendrix – from the balcony. In 1973, the balcony scene was wild, with toking and groping abundant. 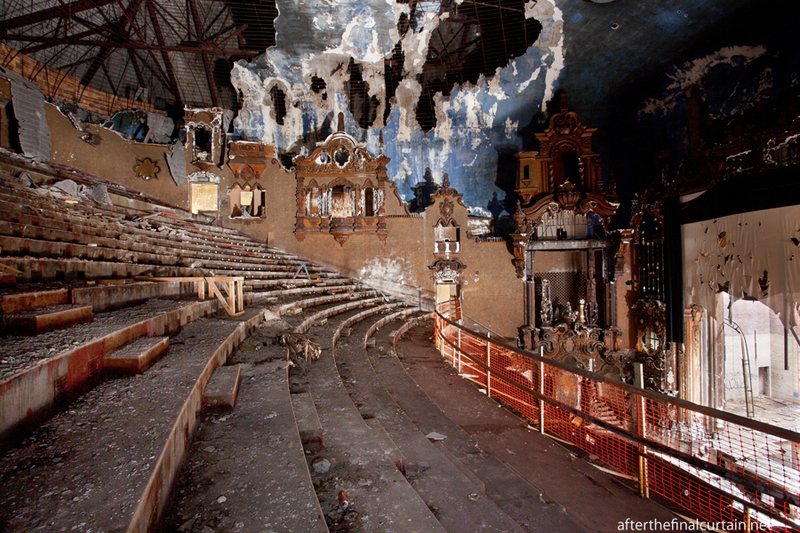 Very sad to see what has become of this magnificent theater. I grew up in Flushing and RKO Keith was always one of my favorite places. Although I moved from Queens years ago, I am furious that we let our grand, historic palace fall into such disrepair. It’s so sad tgat we allowed a greedy developer to do this. 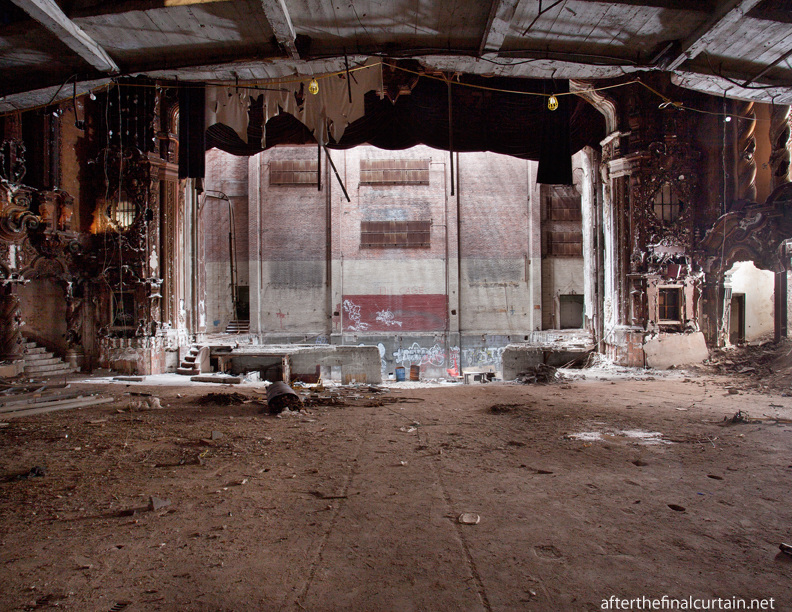 I truly pray that the theater gets completely restored to its original state so our children and grandchildren can enjoy it for years to come. they will not fix the theater because they want it torn down. simple as that. Hi Mary – The RKO Keith’s was triplexed in the late 1970s so there were actually three movies shown on the final day. They were “Texas Chainsaw Massacre II”, “Night of the Creeps”, and “Running Scared.” The last showing of “Texas Chainsaw Messacre II” was at 11:10 PM and the movie was 2 hours and 20 minutes long so that would make it the last movie shown at the RKO Keith’s. Was the lobby also atmospheric? And if so, was that common for atmospherics? 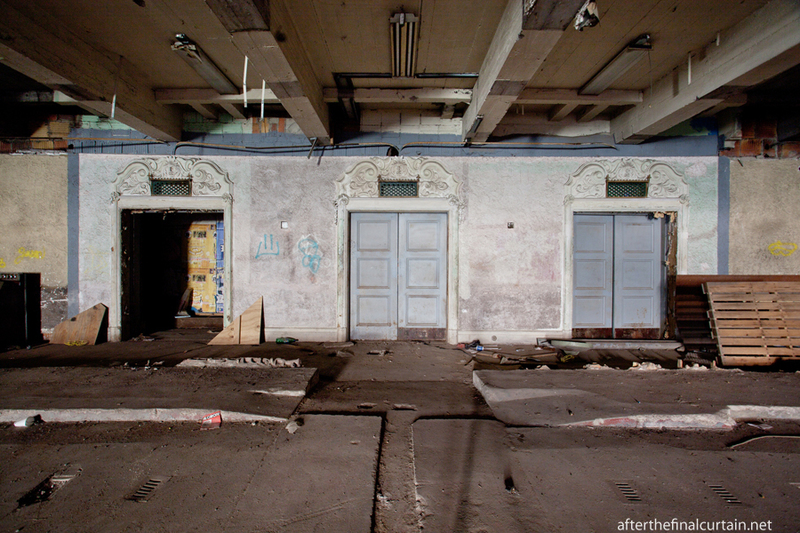 Yes, the lobby was also atmospheric, and no that was not common. How were you able to gain entry into the theater? You were allowed to just walk inside? I guess it might be different now since that was seven years ago.